Isn't this darling? Love those little bluebirds. And her bullion daisies. So sweet. It is sweet! And what a lot of work. It reminds me of the patterns I used to embroider as a child. My 86-year-old mother still embroiders pillowcases similar to this - except without the bullions! LOVE this! 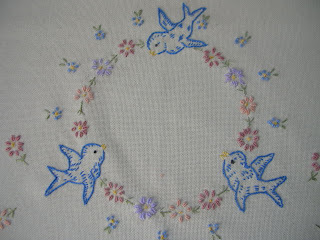 It reminds me of one of my very first embroidery projects that my Granny did with me when I was but 5 or 6 years old. We embroidered pillowcases that I still have. Hers were perfect; mine weren't and I TREASURE them! She taught me to love a needle & thread. 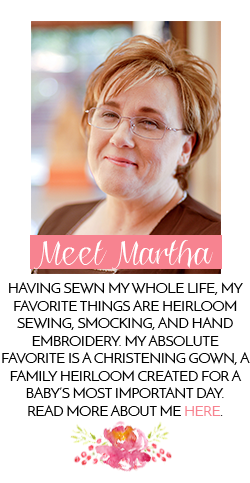 Martha, I, too, have pillowcases that my grandmother hand embroidered YEARS ago that look very much like these! Such a timeless & charming design.